A Desktop connector source defines a set of configuration parameters determining the end-user computers on the network of your organization from which content can be indexed. The Desktop connector operates with the Desktop Integration Package (DIP) deployed on end-user computers. The source identifies end-users for which files on desktop and laptop computers that they use should be indexed. The source also identifies the port (1980 by default) on which the connector listens. While the end-user computers are connected to your organization network, the DIP client regularly (every 10 minutes by default) contacts the Coveo server on the Desktop connector port to push new, modified, moved, or deleted local files from the folders specified to be indexed on the computer, thus keeping the index up-to-date. Note: End-users can configure the local folders to index and review the indexing history from their computer (see Controlling and Monitoring the Personal Folders Indexing Process). It is recommended to create one Desktop source for all your desktop or laptop end-users. If you need to create more than one Desktop source, use a different port for each source and adapt your DIP deployment to use the appropriate port accordingly. Select the connector used by this source. In this case, select Desktop Connector. Note: If you do not see Desktop Connector, your environment does not meet the requirements (see Desktop Connector Requirements). The list of users whose computer content is to be indexed. Enter * to index the content of all end-user computers. Alternatively, enter usernames on separate lines in the form domain\username or username@domain. You can not specify groups. Note: When a user logs to more than one computer on which the DIP is installed and local folders are configured to be indexed, the content from each computer is indexed for this user. Time interval at which the source is automatically refreshed to keep the index content up-to-date. This connector supports incremental refreshes, so the recommended option is either Every Sunday or Every day. Note: You can create a new (or modify an existing) source refresh schedule (see Creating or Modifying a Source Schedule). Example: You can schedule the refresh at lunch time for which chances are higher that many desktop or laptops are powered on and connected to the organization network and, that the indexing will less likely disturb users. Change this value only when you want to globally change the rating associated with all items in this source relative to the rating of elements in other sources (see Understanding Search Results Ranking). If you created a custom document type set for this source, select it (see Creating a Document Type Set). Otherwise, select Default. If you defined custom field sets, ensure to select the most appropriate for this source (see What Are Field Sets?). Computer port used by the Desktop Integration Package to communicate with the Desktop connector. The default is 1980 and should not be changed. If you must use another port, you need to deploy the DIP using the GPO method and specify the same port number (see Configuring the Desktop Integration Package GPO). The maximum number of DIP clients from end-user computers that can simultaneously be connected to the Desktop connector. The default value is 50. When the limit is reached, new connection requests are refused. DIP clients automatically retry 10 minutes later when the Desktop connector refuses a connection. Click Add Parameter when you want to show advanced source parameters. There are no advanced parameters for this type of connector. The Coveo Support could instruct you to click Add Parameters to specify other source parameter names and values that could help to troubleshoot issues. This parameter does not apply and is not taken into account by the Desktop source. Leave the check box cleared. This parameter needs to be checked only in rare cases for systems in which distinct documents may have the same name but different casing. Select this check box so that at indexing time, CES creates HTML versions of indexed documents. In the search interfaces, end-users can then more rapidly review the content by clicking the Quick View link rather than opening the original document with the original application. For a Desktop source, when the end-user computer is offline or powered off, the Quick View is the only way to review the content of the documents. Consider clearing this check box only if you do not want to use Quick View links or to save resources when building the source. In the Security Provider drop-down list, select Active Directory or a custom Active Directory security provider that you created for a specific domain (see Configuring an Active Directory Security Provider). Note: CES 7.0.4863– (September 2012) The Authentication parameter is not taken into account by the Desktop source. The user identity comes from the DIP clients. When end-users accounts have read access to Active Directory, select (none). When only specific Windows accounts have read access to Active Directory, select a user identity with credentials that can connect to LDAP to retrieve information on remote clients. Note: When your LDAP server is not the default server, you can use the LdapSearchRoot hidden parameter to target a specific LDAP server, port, or path when searching for remote clients accounts (see Modifying Hidden Desktop Source Parameters). Important: When end-users do not have read access to Active Directory and you do not specify a user identity that has read access, Outlook items (.Pst or .Ost) will be indexed but no mailbox will be assigned to their @sysmailbox field. The consequence is that end-users will not see their emails in the search results. If this situation occurs, set the Authentication and the LdapSearchRoot parameters appropriately so the LDAP search performed by the Desktop Connector can find the LDAP accounts for all remote clients. 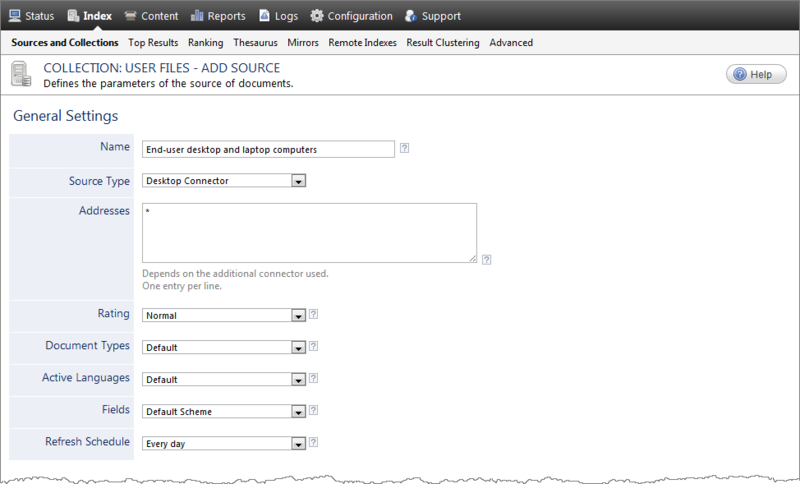 Click Save and Start to save the source configuration and start the indexing of the new source. The indexing starts only after the DIP is installed on one or more end-user computers connected to the organization network, and folders to index are configured. Deploy the DIP on end-user computers (see Desktop Integration Package Deployment Overview).